The global market for remote patient monitoring is presently valued at $22 billion. In 2017, the remote patient monitoring market is expected to reach $46 billion. More than $19 billion in funding was allocated for Healthcare IT as part of the 2009 American Recovery and Reinvestment Act (ARRA). 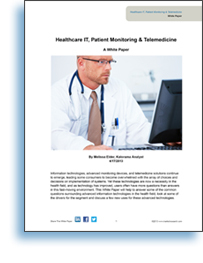 Download this whitepaper to learn what you need to know about Telehealth and Remote Patient Monitoring.